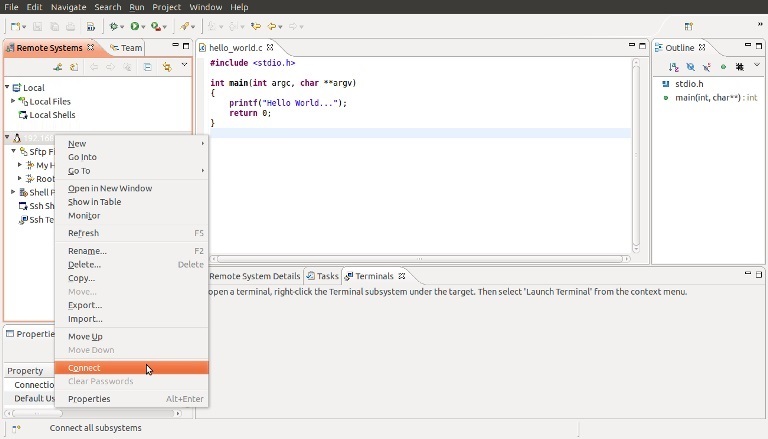 This article provides step-by-step instructions on how to cross compile a simple Hello World application on the development host using the Linaro toolchain, either through a command line shell or Eclipse. It also gives instructions on how to run the application on the target device. 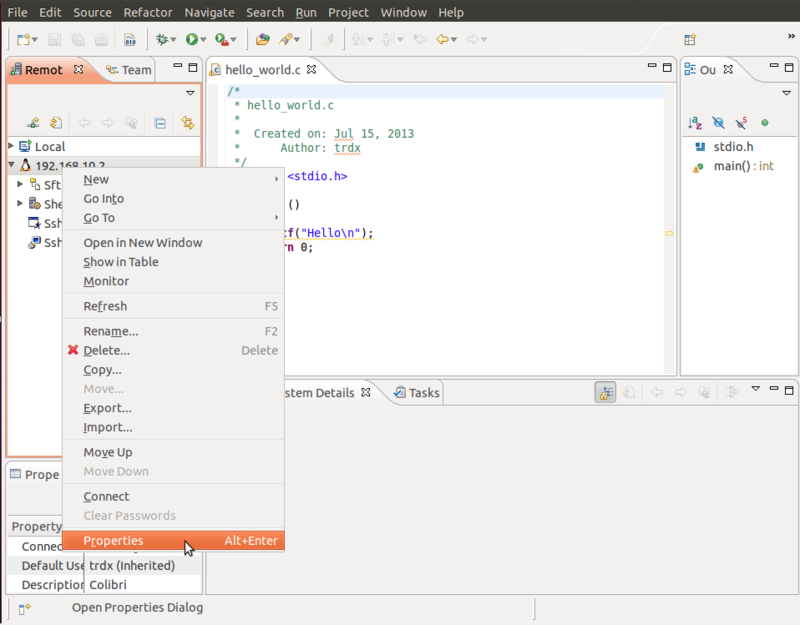 In addition to a simple Hello World application, we are using the gtk-scribble example for the Eclipse introduction. Follow this article for information on setting up your environment for Embedded Linux application development. 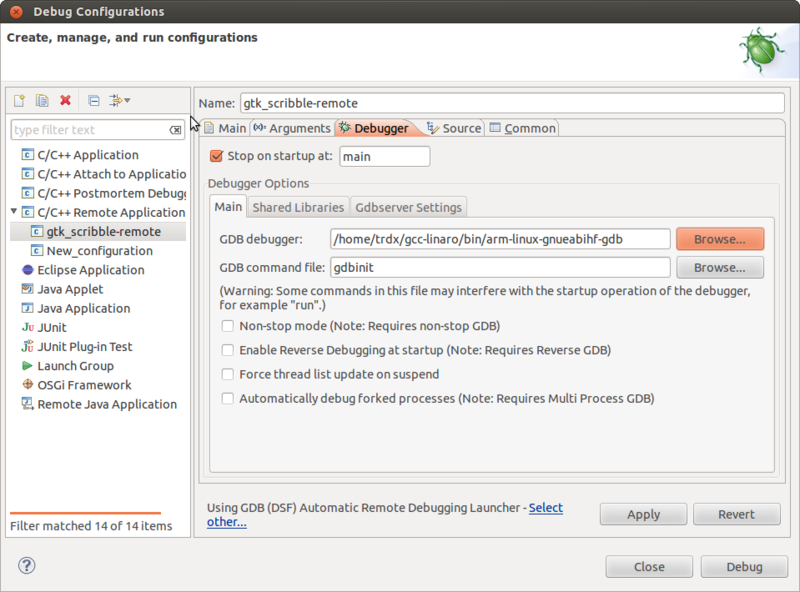 Alternative to the Eclipse configuration presented in this article (which uses the Linaro toolchain), you can check the Getting Started Guide and the Linux SDKs article (which use OpenEmbedded generated SDKs). 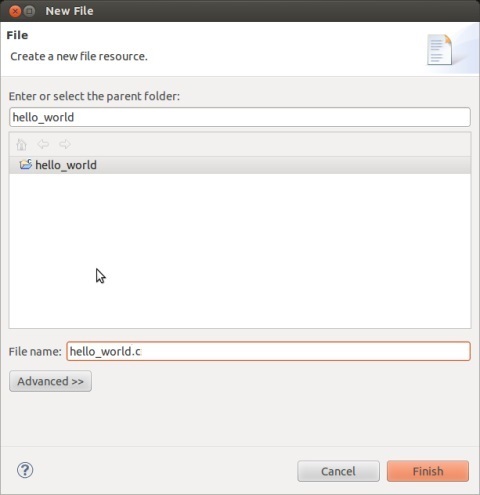 Create a new "hello_world.c" file. This source file is used to print "Hello World" to the standard output device. Note: the '&' at the end of a command line forks the started process and runs it in the background. You immediately get back the prompt in the terminal window to enter further commands and the background process will not be terminated when the terminal gets terminated. Use Ctrl+S to save the editor content. Note the "-mfloat-abi=hard" needed for the Openembedded toolchain which starting with V2.4 of our images defaults to "-mfloat-abi=soft" and the "--sysroot=..." needed for the gcc 5.2 cross compiler which is used starting with V2.6 of our BSPs. Copy the "hello_world" application file to the target device. Two options are described here: 1.Copy the file to the target device using a USB memory stick. 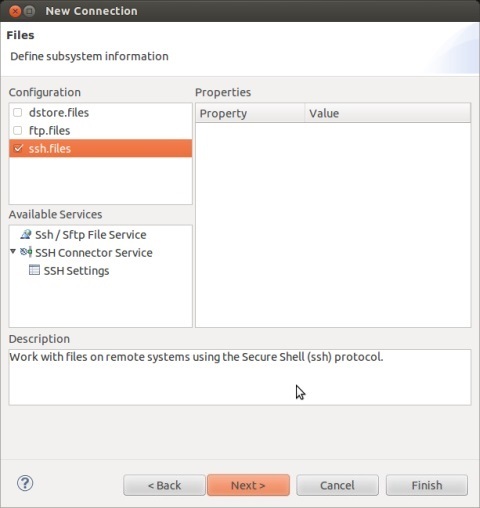 2.Copy the file using a Secure Shell (SSH) via the network between the development host and the target device. 1. Copy the file to the target system using a USB memory stick. Copy the "hello_world" application file to the USB memory stick. Connect the USB memory stick to the target device. 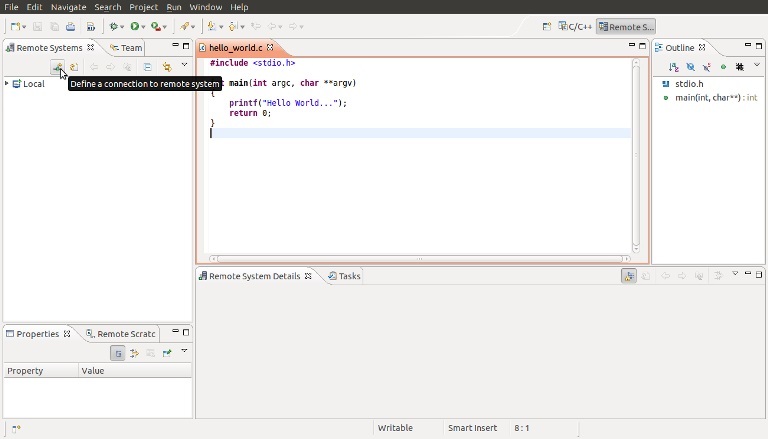 Copy the "hello_world" to the target device. 2. 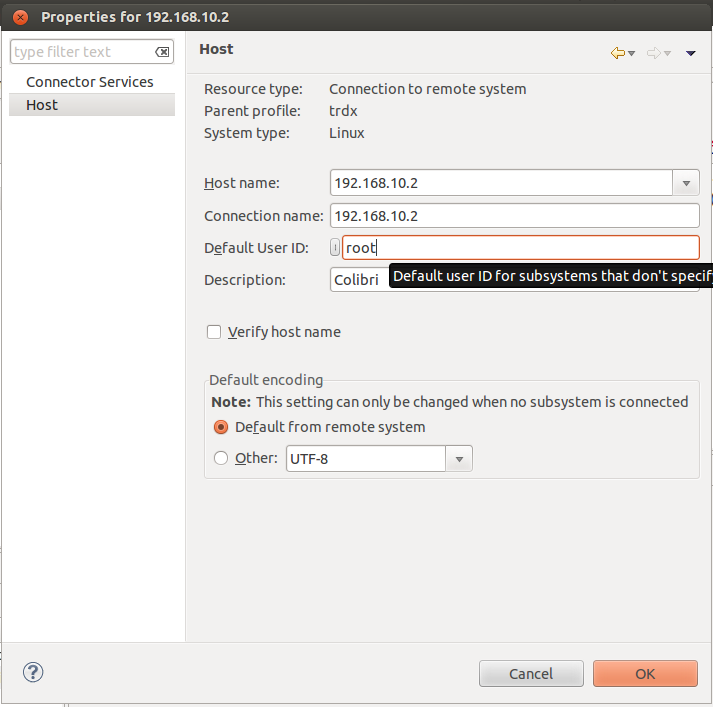 Copy the file using SSH via the network between the development host and the target device. Check the IP address of the Ethernet interface on the target device. Note that in our images a SSH server is already installed and active by default. 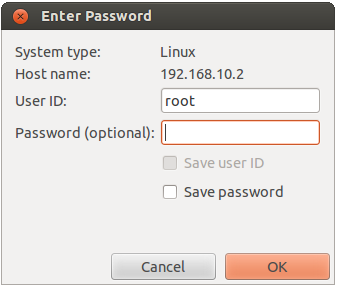 Enter the root password for the target device (none set by default) and press Enter. Run hello_world on target device. Check it with ls -l, set it with chmod if needed. 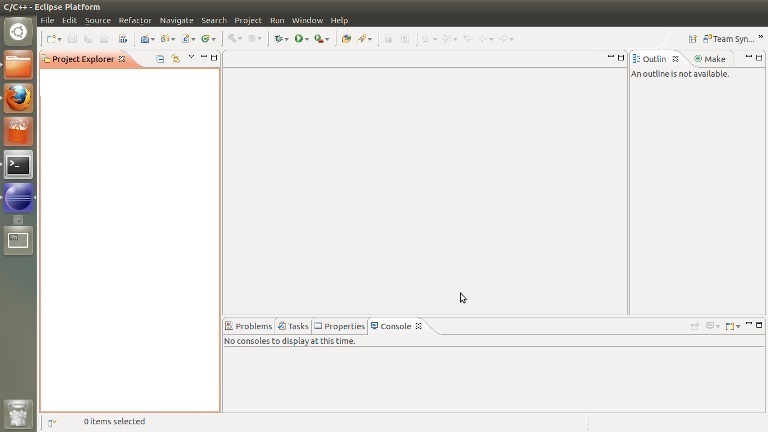 Get the gtk-scribble Eclipse project and start Eclipse. 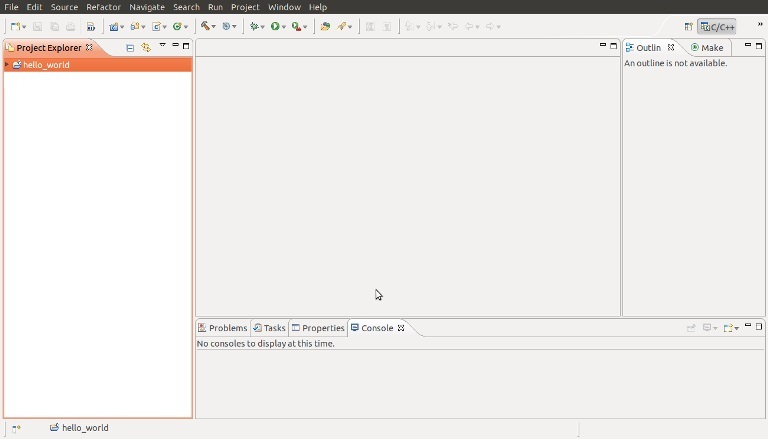 In Eclipse a view is a child window showing data in a specific form, e.g. 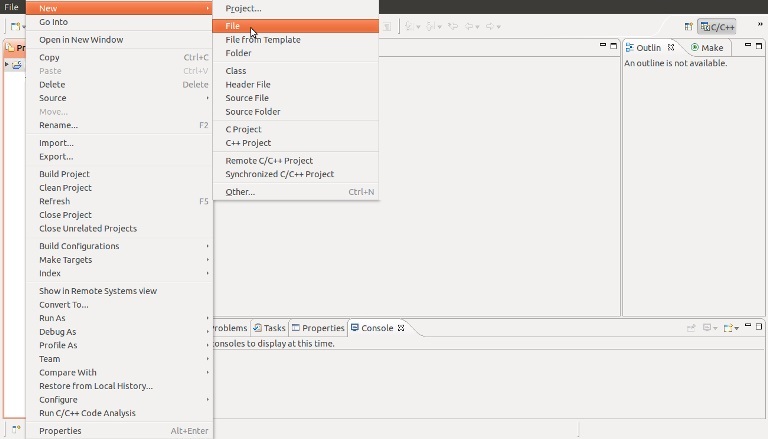 the Editor view displays a file, the Project Explorer view shows the directory/file structure of your projects. A Perspective is a collection of such views which are shown at the same time and enable you to do certain tasks, e.g. the C/C++ Perspective enables C code development. 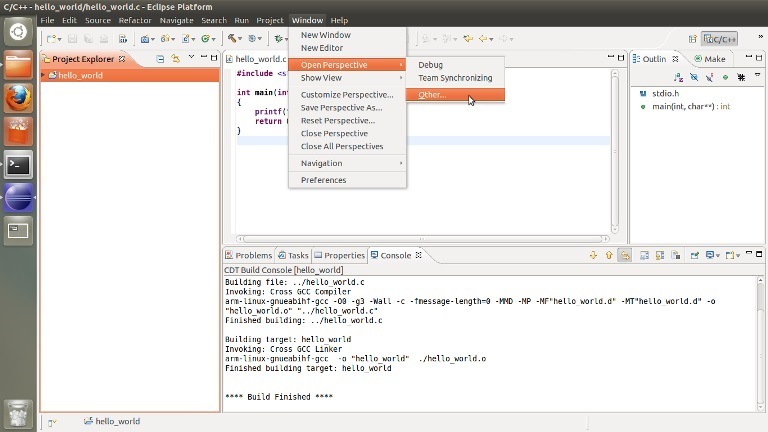 Switch to the C/C++ Perspective by using the menu Window->Open Perspective. Use menu File->Import, General/Existing Projects into Workspace, select Archive File and Browse for gtk_scribble_V2.zip. Click Finish. In the Project Explorer view double click the README file and read it. sudo sh -c "ls -w 1 | grep '\.so\.[0-9]*\.[0-9]*\. [0-9]*$' | sed -r 's/(.*\.so)(\.[0-9]*\.[0-9]*\. [0-9]*$)/ln -s \1\2 \1/' > makesymlinks.sh"
The Make Target view provides a convenient way to call make with various targets. 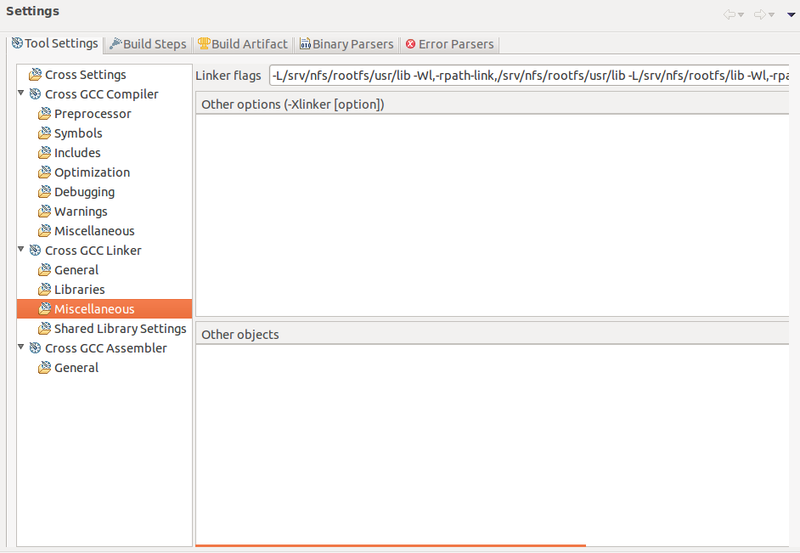 Right click 'all' and choose edit to inspect what parameters are passed to make for a given entry. Leave the dialogue with Cancel when done. Double click the x86 all target to compile the code to run on your x86 host. Note that some intermediate files plus the executable 'scribble.x86' appear in the Project Explorer. Double click the all target to cross compile for your target. Note that the executable 'scribble' appears in the Project Explorer. Copy and execute the scribble file on the target in the same way as we did with the hello_world file. 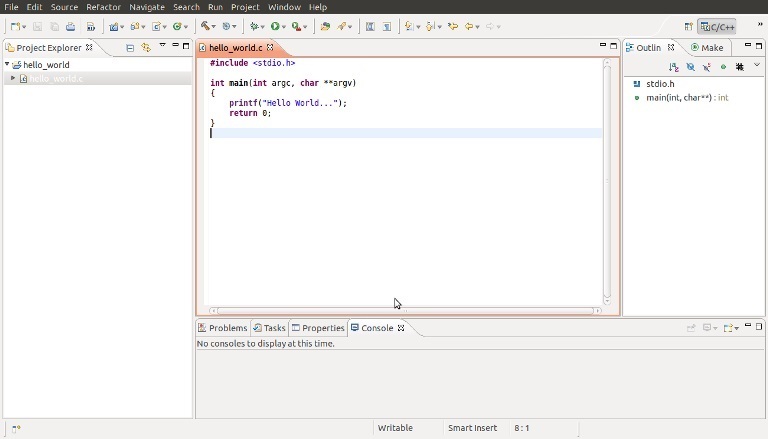 Create a New C Project "hello_world" in Eclipse. Using the mouse, select C project and Next. Add a new "hello_world.c" file to the project. Once we have an empty project hello_world created the next step is to add files to the project. 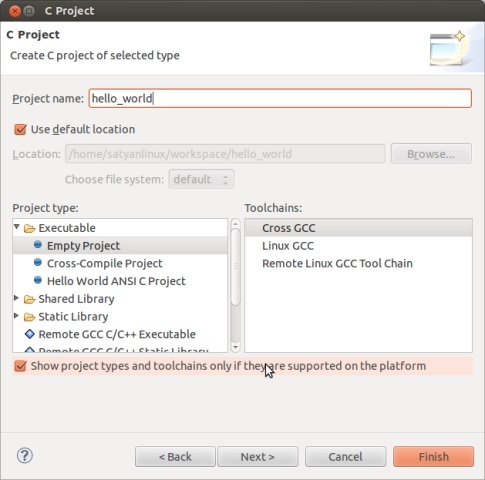 Type the C program in the "hello_world.c" file and Save. 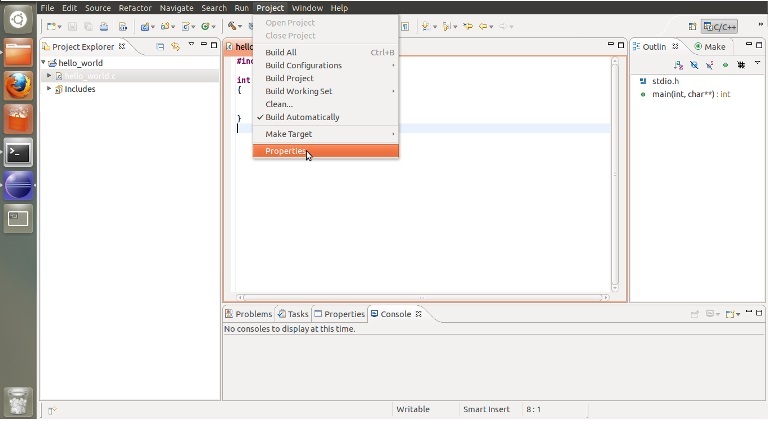 Configure project build properties for the target device. Note: If we build the project without configuring the build settings, the program will get compiled and build for the development/native (x86) platform. Enter the cross toolchain prefix "arm-linux-gnueabihf-". Enter the full directory path for "gcc-linaro/bin". Note: Set 'march' & 'mtune' according to the target architecture. Note: Be sure to enter the path to the target's rootfs as it resides on your host machine. 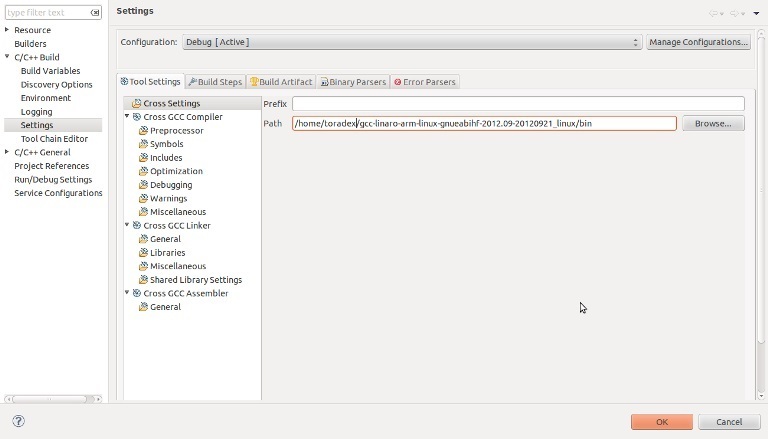 The rootfs is provided in our evaluation Linux images or it may be built using OpenEmbedded. 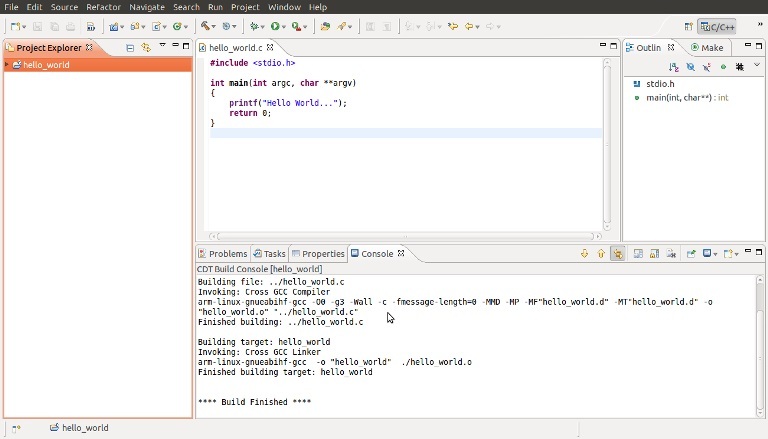 Now, the "hello_world" application is ready to be deployed to the target device. Check the Debug folder with the intermediate files and the executable file hello_world. 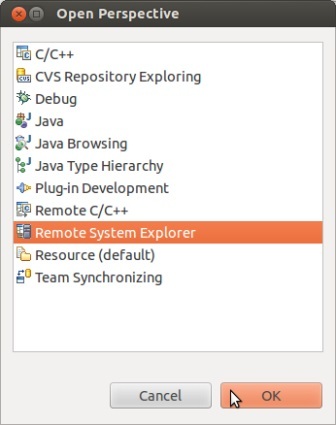 The Remote System Explorer plugin allows accessing other computers over Ethernet from within Eclipse. 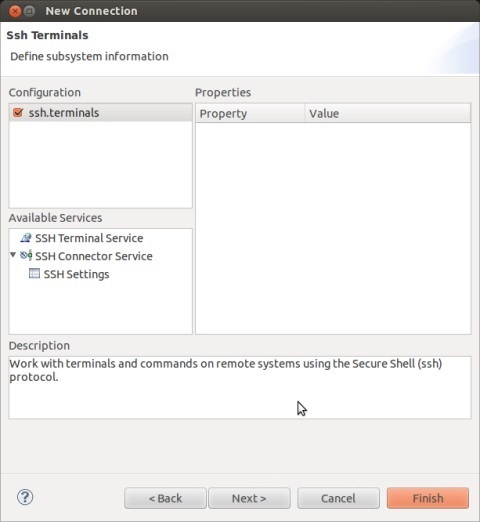 For the connection with our target device, we will be using SSH as the transport protocol. 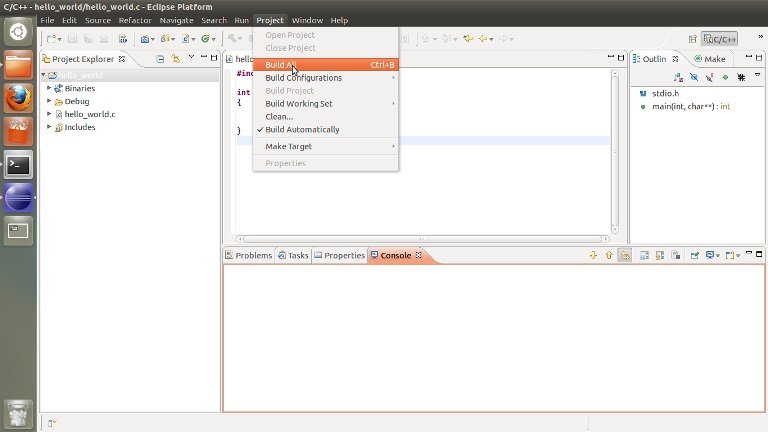 This feature is mainly used for debugging on the target from within Eclipse. 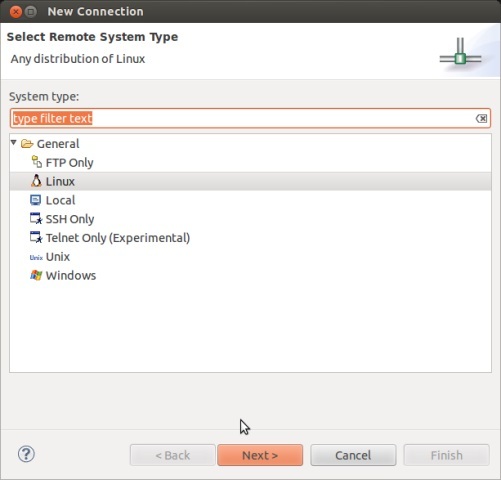 Create a Remote System Explorer connection. Host name: Enter the IP address of your target device. 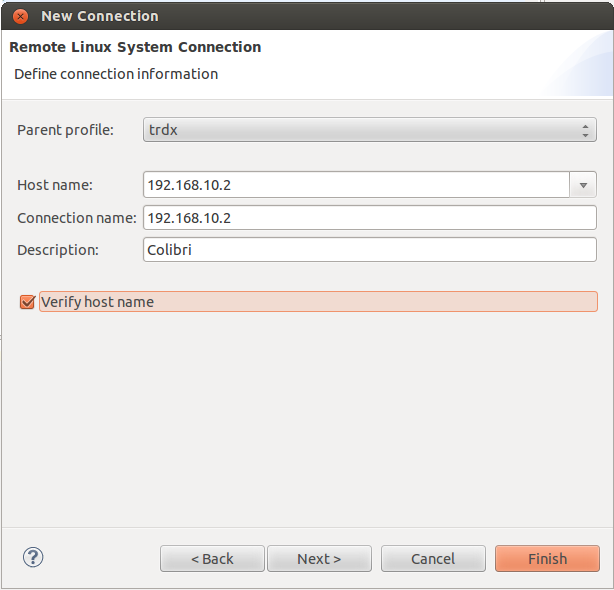 Connection name: The default value is the same as the host name, but this can be changed to a more human readable value. Description: Some suitable description for the connection. By default, Eclipse uses the User ID from the host to login to the target. Connect to the target with the Remote System Explorer. Enter the password for the target device (none set by default) and press Enter. 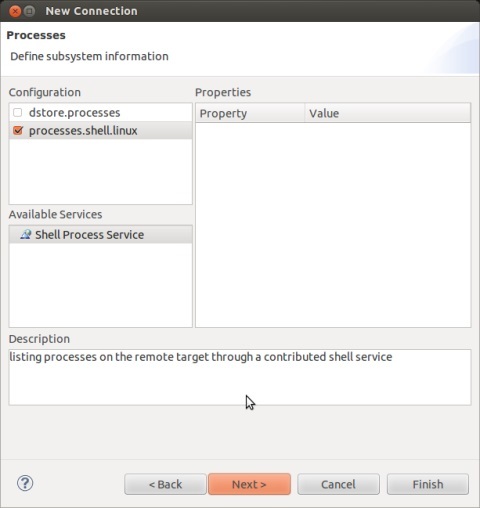 To access the target device, use the SSH terminal in Eclipse. 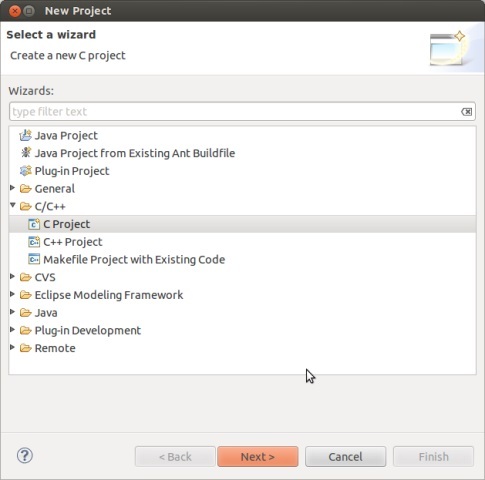 - Eclipse is used to setup the target device and the development host. 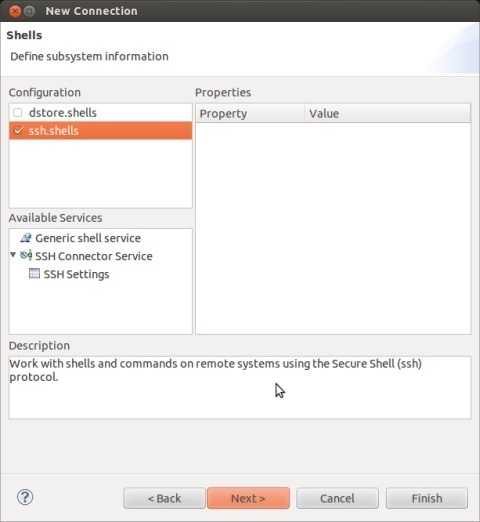 - A Remote System Explorer connection is used to start things on the target device. - On the target device, the gdbserver is used to start and control the program to be debugged. - On the development host gdb is started and a connection to the gdbserver over Ethernet is established. 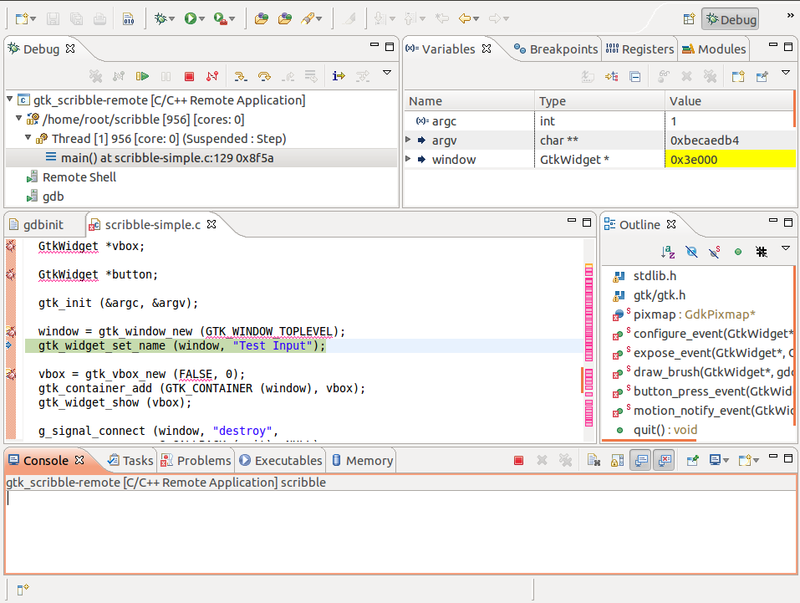 - Eclipse is used as a graphical front-end to gdb. Note: If you are using a V2.4 Beta 1 image you have to change /etc/profile on the target. Comment the resize command towards the end of the file or your debugging sessions will not be started.